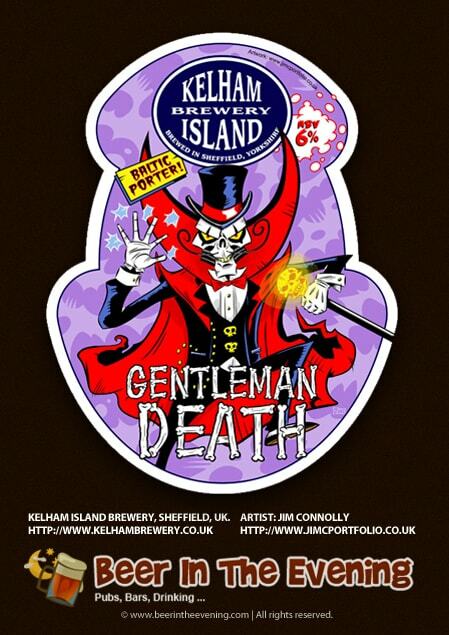 There is something brewing at Kelham Island Brewery, and it’s not just beers. A unique mash-up of hops and comic book characters is erupting, pale ale heroes are slogging it out against dark beer villains in the “Light vs. Dark” battle of the brews. Who will win? Will the two join forces to fight the fizz-keg army? Kelham Island, based in Sheffield, was the first independent brewer in the city for over 100 years. It was at a time when real ale sales were falling and the big brewers were retreating from the area. Hope & Anchor, Whitbread, Stones and Wards breweries all closed in Sheffield during the nineties. Big things have such small beginnings, and from the beer garden of the Fat Cat, Sheffield in 1990 Kelham Island first began brewing with a 10 barrel capacity. Popular demand saw sales increase and the decision was taken to move the brewing operation to a more permanent 100 barrel capacity residence. Today, if you are lucky enough to visit the Fat Cat, the original brewing house is now a visitors centre dedicated to the success of the Kelham Island Brewery. Jim Connolly is a mild-mannered artist by day, but by night, he drinks the occasional beer and enters into a world where heroes strive to protect the ale from an evil fizz-keg army. 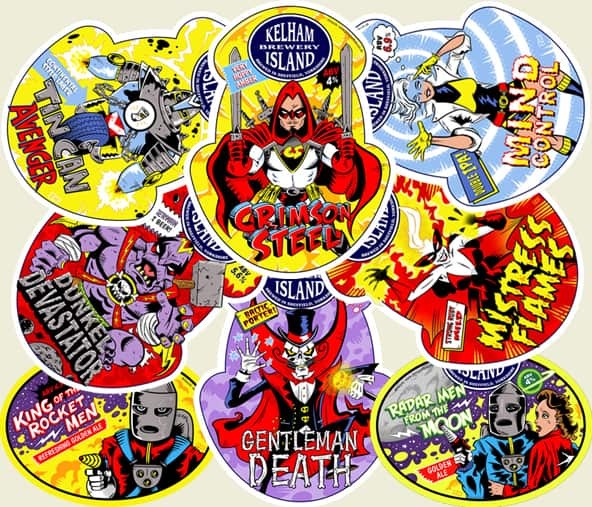 Mixing two popular genres, comic books and beer, Jim has lovingly created a series of heroic beer labels for Kelham Island Brewery. The mash-up of beer and comics doesn’t stop at just the beer label artwork, each character comes with their own back-story to tell, and in true story-telling style, each pale ale hero comes their own dark ale nemesis! We were lucky enough to speak to Jim and ask him some questions about his part in bringing the beers, their labels and pump-clips to life. Q. 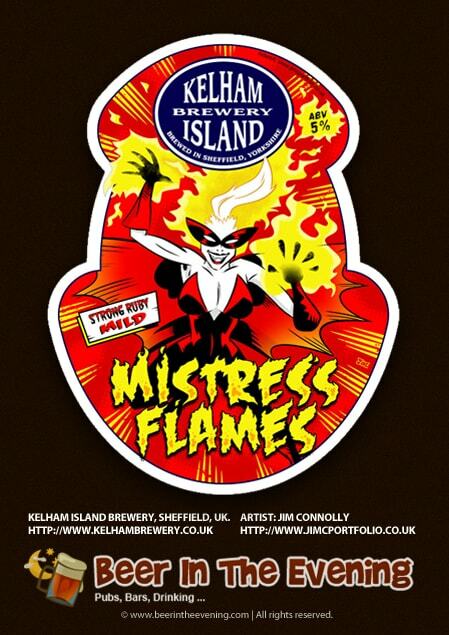 Who came up with the names for the Kelham Island Beers? The Kelham guys gave me the basic concept for the heroes and villains and let me run with it. I did a pile of quick doodles and we chose the best ones and made the names up together. The King of the Rocketman & Radar Men Men from the Moon pumps were the brainchild of Little Mick who works for Kelham Island. Q. Who or what has been your biggest inspiration for these labels? In Superman 2 there are three great baddies in General Zod (the mastermind), Ursa (the tough babe) and Non (the muscle) and I wanted each side to pretty much fit this model. I looked at some of the early Marvel character designs by the likes of Jack Kirby & Steve Ditko as I wanted the colours to stand out and be fun. ‘Gentleman death’, ‘Mistress Flames’ and ‘Crimson Steel’ feel more like DC characters down the Batman route, with a hint of Tim Burton. Q. Can you give us the back story to some of the Kelham Island characters? Crimson Steel (hero) He started life as a homage to Sheffield United FC with his double swords but became more like an English knight. He’s a bit Aragorn and a bit Batman-esque. 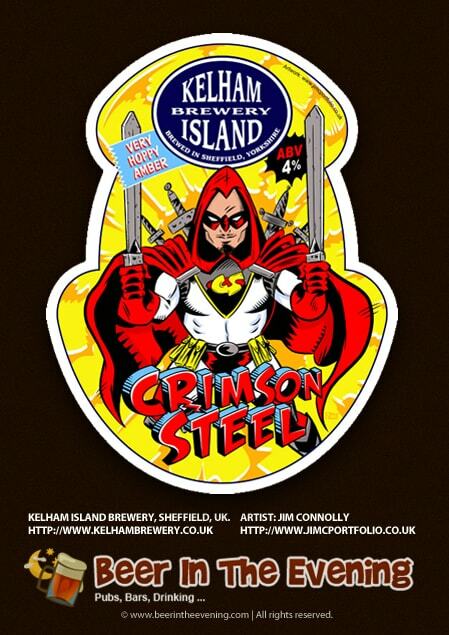 In comparison Crimson Steel ale is bright and amber in colour, described as very hoppy, it’s like the best of all things good, so it makes sense to have Crimson Steel as the lead-hero. Gentleman death (villain) He uses black magic to achieve his dastardly ends. He’s a bit like Skeletor crossed with Basil Fawlty. In comparison Gentleman Death is a rich, dark, Baltic Porter, it clings to the edge of the glass like a lingering evil magic. 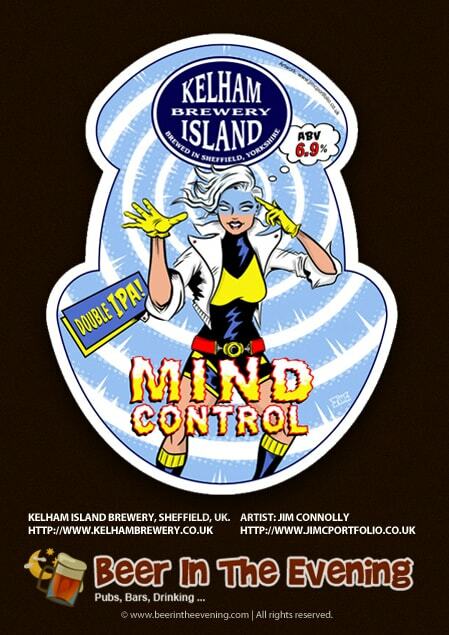 Mind Control (heroine) She’s quite Xmen inspired with similar mind powers to Professor-X, of course with added telekinesis, no doubt derived from her double IPA. The intense hoppiness of Mind Control is perfectly balanced with complex alcohol flavours, the ‘force’ is definitely strong with this one. Mistress Flames (villain) She’s a vampire but with fiery blood and flame-throwing abilities. By comparison Mistress Flames is a mild ruby ale with deep flavours and colours, it looks very vampire, very moody and comes with some spark. 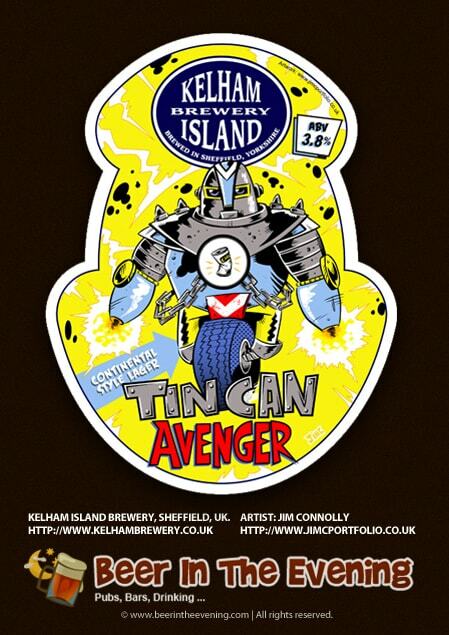 Tin Can Avenger (hero) His mission is to prevent the consumption of cheap dirty lager whilst wearing his trusty metal-head unicycle armour. He’s a parody of the earliest Ironman design with a nod to Ghostrider as well. In comparison Tin Can Avenger is a continental style lager beer with a lower alcohol content, it’s got a lot of strength in flavours but with it’s mildness it’s a beer you can keep coming back to. 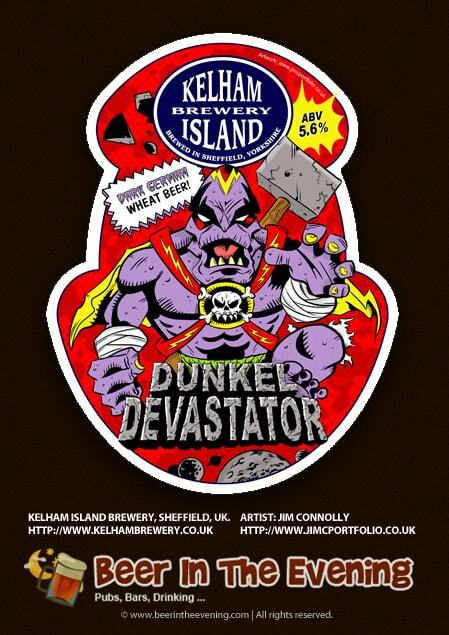 Dunkel Devastator (villain) He leaps across the universe delivering shattering blows to far-off worlds with his fizz-keg hammer of doom. If he could find earth we’d all be in trouble. Luckily he’s incredibly thick. By comparison, Dunkel Devastator is a powerful, dark German wheat beer. Here in Britain wheat beers are not considered traditional, which makes Dunkel Devastator sort of a very strong, loose cannon amongst the real ales. 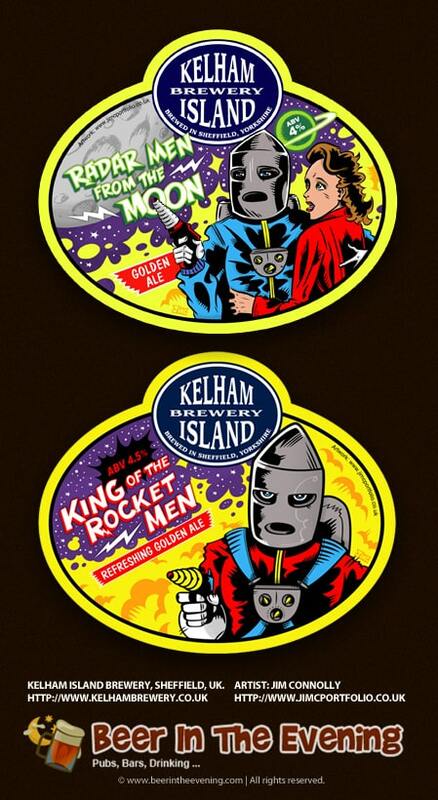 King of the Rocketmen & Radar Men from the Moon: In a homage to the old 1940’s serials that pre-date Superhero movies, Kelham Island have also brewed “King of the Rocketmen” and “Radar Men from the Moon”. Described as “blazing adventures in a glass” these two use internationally sourced hops to give an out of this world aroma, light and refreshing with just enough “zap” to keep you tuned in for more. Which was your most favourite of the beer label characters to create? ‘Mistress Flames’ is my personal favourite by a mile. She was inspired mainly by a Mike Mignola, Batgirl cover from the 1980’s. Any thoughts on producing comic strips for any of the characters? As both comic-books and real ale are enjoying both mainstream and niche markets success, it’s certainly food for thought. I’d like to see the Dunkel Devastator show up at my old local wielding his hammer of doom! Will you be working with Kelham Island in the future? I’m hoping to work with them on an art-print very shortly to tie-in with the labels I’ve done for them. For other brewers out there, are you a gun for hire? I’m always up for hearing about interesting commissions, beer label design has a long tradition in the UK, there’s hidden subtlety and meaning in each design. If you are interested in Kelham Island Brewery beers you can read more or place an order on their website. For a list of pubs in Sheffield follow this link. If you have a comment feel free to leave it in the comments section below, or join in the conversation on our Facebook page. 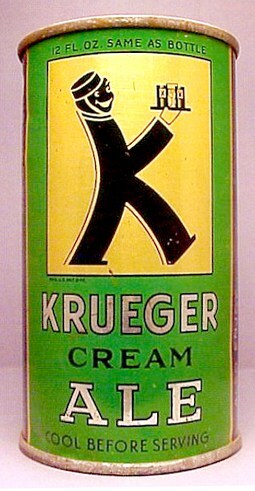 Not long after the abolishment of American Prohibition in 1933, the small, almost failing brewer Gottfried Krueger Brewing Company teamed up with the American Can Company in 1934 to produce 2,000 cans of Krueger’s Finest Beer and Krueger’s Cream Ale. Delivering 4 tins of beer to 500 families in the area. It was to be a make or break experiment for the Krueger Brewing Co. Lucky for them, as results came in, 91% of people gave the new way to package beer their honest approval. With this kind of market feedback green-lighting the way the Krueger Brewing Co. decided to go into production. With a little further refinement to the tinning process to stop beer sticking to the edges and rim of tins or to stop the tins warping under the pressurised contents, the first ever tinned beer went on sale, this day (24th January) in 1935! The tin of beer had a simple clear design without the fuss and small print crammed onto today’s packaging, Kreuger’s tins displayed just once piece of advice to drinkers, “cool before serving”. The tin itself was crude by today’s standards but was no doubt modern or even futuristic to the people of 1935. There were no ring-pulls in those days, no widgets, no gimmicks, just beer in a tin. To get to the beer inside a drinker would have to pierce a triangular hole with a tin opener, the Kreuger Brewing Company slogan at the time was “Be a man, drink Kreuger’s”. Tinned beer was first received by some as just a silly fad, despite the stigma surrounding the invention, sales throughout 1935 rocketed up to 550% making it clear to other brewers that packaging beer into tins was a hugely profitable way to deliver their product. Cash in the attic? Today 24th January 2013, an empty good condition can of original 1935 Krueger’s Finest Beer would fetch you somewhere in the region of £300 at a collectors auction. If you have a comment feel free to leave it below in our comments section, or join in the conversation on our Facebook page. Is it the right kind of snow for 2013? Pubs this year have reported to the Morning Advertiser that trade has been significantly up due to the blankets of snow that have covered the UK this January. Although it’s good news this year for many well located pubs; on country walk routes, or popular sledging haunts. Let us not forget that once the snow has cleared the real figures will tally… It’s most likely to be on par with last year and December 2011 when pub trade was hit by the freezing weather conditions, keeping many pub-goers indoors and out of the cold. Have you spent your “snow days” down the pub? 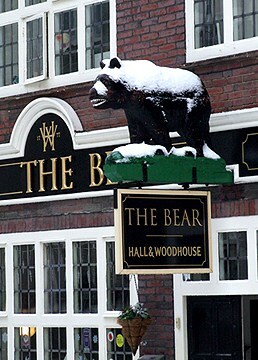 Has your pub trade been hit by the UK’s inability to deal with a few inches of snow? You can let us know in our comments section below, or by joining the conversation on our Facebook page.